No kitchen is complete without a tea kettle- whether it’s an electric or stovetop model. That’s mainly because none of us can survive for long without a cuppa. Personally, I can’t go a day without a cup of my favorite tea. Really, it recharges my body and gives me a feeling of warmth and comfort. Having brewed tea for almost a decade now, I’ve had my feel of tea kettles…I’ve had an encounter with the worst as well as the best tea kettles. Today, I’m here to save you the hassle of reading those time-consuming, non-value tea kettle reviews that populate the web. And I’ll do that by sharing my all-time favorite list of the best stovetop tea kettle and the best electric tea kettle with you. There are two major tea kettles on the market right now- the electric and stovetop kettles. They’re all designed to serve the same purpose of heating water for making your tea. Most households swear by the stovetop because of several reasons… it’s highly affordable, easy to use, and the commonest model in the stores. Additionally, it comes in a wide variety of material designs- like copper, glass, ceramic, stainless steel, cast iron, to name but a few. I usually prefer glass and stainless steel for the obvious reason that they’re easy to clean and maintain. Electric tea kettles popularity also soars as high as that of the stovetop model. But one thing that I love about it is its ability to heat your water much faster (approx. 4-5 minutes) compared to the stovetop models (takes around 7-10mins). Additionally, it comes with more advanced features to enhance its performance and user safety. WAIT... I’ve discovered a new alternative lately…the automatic tea brewer. Honestly, I’ve not yet tried it and don’t know much about it. But a close friend of mine tells me that it’s similar to the coffeemaker. One thing I can assure you about this new machine is that it has much more advanced functionalities and sells at crazily high prices. Hopefully, the price will soon go down and make it affordable to you and me. In my tea kettle reviews below, I’ll point my lens on the two most popular models: Electric and Stovetop Tea Kettles. Now get ready as we kick off our discussion of the BEST tea kettles below. I’ll start with my very first electric kettle- the Ovente KG83 Series 1.5L model. Right from its looks, it’s easy to fall in love with this kettle. The unique, modern tea kettle features an attracted black color plus a glass construction that makes it for you to observe your water as it boils or tea particles as they slowly dance to the steeping rhythm. On top of the unique shape, it has a blue LED lighting that makes you feel like you’re preparing your tea in paradise. With a capacity of 1.5 liters, it has never disappointed me whenever I wanted to make serval cups of tea for my visitors and me. The only thing that gave me headaches when using this kettle was the oversize handle that seemed to bulky for me…maybe that’s because if my hand's size. But with its undeniable performance plus a load of unique design aspects, and pocket-friendly price tag, you’ve found a great deal in this Ovente! For the ceramic lovers in the house, BELLA offers you an irresistible offer in this 1.2L Electric Ceramic Tea Kettle. It has that timeless beauty and thoughtful features that make it a great addition to your kitchen. It features a 1200 Watt heating element that quickly heats up to 1.2-liter water to ensure you make your teas as quick as you please. While heating your water faster than the stove, the model prevents any hazards from happening in your kitchen with its dry protection and auto shut off safety functions. The manufacturer expresses an intelligent design in this model with the long neck spout design. This makes it easy for you to make controlled pours- especially when serving tea, coffee, and gourmets with this kettle. I had an easy time operating this unit, thanks to its one-touch operation that lets you flip the switch once to go from cool to boiling in mere minutes. Similar to other top quality electric kettles that appear on this list, this unit comes with some great features such as concealed heating element for easy cleanup, detachable 360 degrees swivel base for increased kettle portability, and an inbuilt convenient cord storage. I remember how I used to place this beauty on the table in my living room and visitors couldn’t stop admiring it. It’s a timeless beauty that makes you make your tea in style. Whenever you crave for tea, coffee, hot chocolate, or instant soup, call on the Hamilton Beach 40880 Stainless Steel Electric Kettle, and it’ll have it ready in minutes. I enjoyed every bit of this kettle…especially the rapid boil system that’s powered by 1500Watt to provide a fast heat up for your water. Like any other Hamilton Beach kitchenware you’ve used before, this unit is durable and optimized for optimal performance. It features a stainless steel carafe construction plus a plastic handle (that remains cool to the touch). Its cord-free design makes it even more user-friendly. And just like other electric kettles, it comes with auto shutoff switch that prevents it from boiling dry. With a 1.7 liter capacity, I’ve used this kettle countless time to make up to 7 cups of tea, coffee, soup, hot chocolate conveniently. I love its 360-degree rotating base which makes it easy for you to pick the kettle anytime, making it a flexible model. Besides, it’s compact, and you can easily move it to any place you wish. The kettle is compatible with all the standard outputs, so you just need to plugin and start brewing your tea. Additional features that make it a high-quality model worth every penny include stay-cool handle, push-button lid, two water level indicator, and easy pour spout design for easy filling and serving. I didn’t have a single issue when using this Hamilton tea kettle, and I trust you’ll love it too! This takes me back to my college days. I was doing some quick shopping for my new “kitchen,” and bumped over the Proctor Silex K2070YA Electric Kettle. It looked like a simple plastic pitcher to me but my opinion changed immediately I used it to make my first cup of hot chocolate. It did that in a matter of minutes, thanks to its rapid boil 1,000Watt heating system. Boy, I was I impressed! The kettle saw me through my first year before I decided to try the other models. And trust me, I’ve used to make not only coffee, but also hot soup, chocolate, and coffee in mere minutes. When the manufacturer claims it’s faster than the microwave, you got to believe it. Like all the other top rated tea kettles I’ve come across, this Proctor also has some smart features, all at a very low price. Some of the most notable features include the safe, convenient auto-shutoff function, detectable power cord (for easy pouring), and double viewing windows. I’d recommend you to consider this as the best electric tea kettle for your home, office, or for your hostel (if you’re on a tight budget like I was). It comes with one-quart capacity that’s enough to meet your tea making needs. I didn’t like the plastic construction. But get me wrong; this is a highly durable model that took me through my first year at college…the material simply depends on your personal preferences. That I bought this unit when I was joining campus and living a frugal life should tell you one thing…that it has an amazingly low price tag despite all the wonder features it comes with. It’s no wonder it’s a popular pick for most households out there! Recall what I told you earlier…that stainless steel tea kettles are highly favored as they’re easy to clean and maintain. This is a lesson I learned when I started using this Secura The Original Stainless Steel Double Wall Electric Water Kettle. What even pulls you closer to this kettle is its quality black construction which blends perfectly well with the right kitchen. One thing that impresses me up to date about this kettle is that it’s Super Energy Efficient. It didn’t take me long to note this rare attribute in electric kettles. With its 1,500Watt heating element, it takes only a fraction of time a stovetop or microwave will take to heat cup after cup of your water. Isn’t the real definition of unparalleled performance? Unfortunately, I didn’t find the fancy features found in the more expensive models. Despite this, it has a real great performance and looks well. If most of your kitchen ware are black and you’re looking for a high-quality electric kettle that matches them, I’d suggest that you go for Secura 1.8 Quart water kettle. So my first Ovente was a superb experience, and this drove me to try another of their product- the Ovente 1.7 Liter BPA Free Cordless Electric Kettle. I noticed that this parallel Ovente not only takes after the Proctor Silex we reviewed above in terms of features and construction, but also regarding affordability. The wonderful electric kettle is incredibly easy to use, thanks to its straightforward design. It’s a solid model that works exactly as advertised. It comes with a sizable capacity that’s sufficient tea for one or two (or more)…yes, I’ve used it to make tea before, and I can confidently confirm this. Similar to my first Ovente, this one is powered by up to 1,100Watts, enabling it to heat your water much faster than other models. But, your water needs to be softened before it gets heat faster. IceCubicle has an amazing article on best water softeners and you might want to look at it. On comparing it to my favorite stovetop models (I’ll give you the list later…keep reading), I noted that it’s up to 8% more energy efficient! Similar to all the most electric kettles out there, it also comes with a heated base that you can easily lift for a convenient cord-free filling and pouring. Among the features I liked most in this model include the auto shutoff feature, stay-cool handle, and power indicator light. I still don't like the plastic construction of this unit, but its excellent performance made me stick to it for over nine months. If you’re in dire need for an all-round electric kettle for daily use at your home or office, say hello to the Ovente 1.7 Liter Cordless Electric Kettle! I thought it wasn’t possible to find an electric kettle made of stainless steel on both sides until I met the Cuisinart CPK-17AMZ Perfect Temp Cordless Programmable Kettle. It features 100% stainless steel construction on both its interior as well as its exterior. With its power source rated at 1,500 Watts, this kettle could heat up my water in minutes. What I like most about this kettle is its 6 preset temperatures which helped me make different varieties of tea. When you start using this kettle, you’ll find it easy to heat your water to various boiling temperatures, to ensure your tea obtains just the right flavor! I also like the keep warm function that helps maintain the boiled water at the set temperatures for close to 30 minutes. Truly, this is the kettle from the future! This is a feature I’ve enjoyed in most of the electric tea kettles I’ve used for close to 10 years…and trust me, you’ll love it! The wonders of this Cuisinart CPK-17AMZ are from over…I could lift the kettle from the power base for about 2 minutes without actually shutting off, thanks to the 2-minute memory function. Don’t you like that already? If you want the best cordless electric tea kettle for your kitchen, I highly recommend that you go for Cuisinart CPK-17AMZ. You’ll absolutely enjoy making tea in one of the smartest tea kettles on the market today! This is what I’m using currently... and without a single doubt, it’s one of the most beautiful tea kettles I’ve used before. When I first picked it up, I was first at how light it felt. The kettle holds only a liter of water, making it perfect for the folks who always wait impatiently to make their tea. It will make around 4 cups, which will take you through your day. Like other best electric tea kettle models, this Bonavita unit also allows you to set the exact temperature you want to boil your water. Something more fascinating- you can watch the temperature as it rises in real time. This is the most temperature-precise of all the models I’ve used. The easy to ready digital display lets you easily and quickly make 1-degree increments, from 140 to 212 degrees Fahrenheit. I love its long neck for the obvious reason that it facilitates easy pouring method for pour-over your cup of tea. In other words, it lets you directly serve the tea from the kettle. I know this is a plus because I’ve had challenges doing the same with other kettles. My journey with this electric tea kettle has been good so far. I love its performance, and I think I’ll keep it for a few more years. Grab your unit today and let’s enjoy making tea with this Bonavita product together. Do you usually vary the tea you take? I mean, do you often switch from white tea, black and green tea? If yes, this is the ideal tea kettle for you. It allows you to set the perfect water temperature for steeping any of these teas, so that you can bring out the best flours in them, without the scorching or bitterness taste. That’s the power of the 6-temperature settings that come with this Epica model. The high-performance model operates on a 1500Watt power to quickly bring your water to your desired temperatures. And if you don’t plan to make tea immediately the water boils, you can tell the kettle to maintain the water at your selected temperatures for about 30 minutes. Impressive, right? Other than this, the models come with a string of other advanced features that make it rank among the most popular and convenient models on the market. These features include a cool-touch electroplate handle, 360 degrees swiveling base, water gauge level, and a lid that automatically opens for filling. Let me end the wrap up my best electric tea kettle reviews with an electric kettle I received as a gift from my girlfriend. Aicok kettle remains an all-time favorite to me given the fast rate at which it boils water to your preferred temperatures. 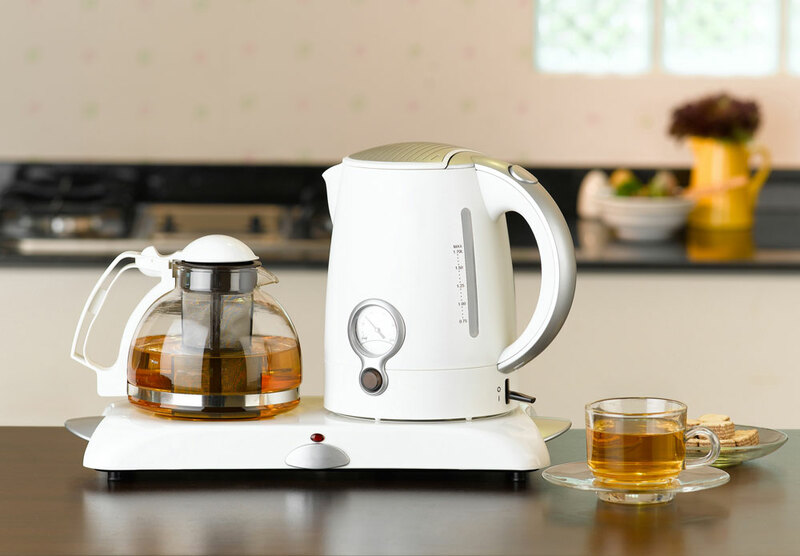 Just start the unit and wait for 2.5 minutes only, and you’ll get 1.7 l water ready for up to 8 cups of tea! Besides a fantastic performance, the unit comes with full stainless steel construction. From the liner, spout, filter, and lid- everything screams stainless steel. Doubtlessly, this is a reliable and durable model that will make tea for you, for years! You’ll quickly note the unique water ring lid design. This helps accelerate the condensate drop, preventing the lid splash hot. It features a gapless, smooth, seamless liner that’s incredibly easy to clean. Other outstanding features worth a mention include a steam induction switch (automatically turns off), high temperature fuse protection, and large caliber design for easy cleaning. For me, whistling kettles bring nostalgia. The sound of the whistling triggers memories. And not only that – the whistling lets me know that the water is at a boil. If you are looking for something that whistles, whether for the nostalgia or the alarm-like convenience, this is the best tea kettle for you. With its sturdy construction that consists of premium surgical grade stainless steel, iron, and aluminum, the kettle’s quality is unquestionable. It is built to last. While cheaper, lightweight types comprise only one or two layers, this kettle has five layers of iron, aluminum, and stainless steel which form a capsule bottom. The capsule bottom takes up heat quickly and distributes it evenly. Like you or anyone else, I appreciate efficiency, especially when it saves me time. It comes with a tea infuser, which will come in handy when you are brewing loose leaf teas such as green teas and herbal teas. The stainless steel infuser is also ideal for brewing coarsely ground coffee. Ergonomic design is supremely important when you are dealing with utensils such as kettles which are hot to the touch during the time of use. For that reason, this tea kettle’s handle and spout are both covered in non-slip, soft-to-the-touch silicone. With a slippery handle, you might spill hot tea on yourself. Furthermore, the non-slip silicone handle is soft to your touch, fits comfortably in your hand, and protects it from the heat of the kettle. The art of tea is delicate. It thrives on special rituals, the little things that make the payoff that much greater when you finally sip your hot tea. And that’s what I like about stovetop tea kettles. This second product of my tea kettle reviews gave me that extra something that an electric kettle cannot. And when it produces that whistling sound, you know the water is ready. Plus, there is something satisfying about hearing the whistle of a tea kettle. It has a heat-resistant phenolic handle that prevents you from burning yourself when lifting the hot tea kettle filled with the steaming water and the heat rising through its scorching body. Some kettles have spouts that dribble. As a result, they get the table top wet. And I know from painful experience that such kettles can accidentally scald your hand if you are not careful. But this Medelco tea kettle has a drip-free spout. When steam builds up within a whistling kettle, it attempts to find an escape, causing vibrations within the chamber. Finally, the steam surges out with speed, with louder vibrations, causing a characteristic whistling sound. But this Cuisinart stovetop tea kettle takes it a step further. It has actual whistles attached to it. As I said before, I like the sound of a whistling kettle. It triggers something in my brain that alerts me I am just about to have a satisfying cup of tea. And with the attached whistles, I couldn’t get enough of this Cuisinart. Even in another room, I could hear them wheezing and know that my water was boiling. Something else I liked about this tea kettle was its ability to retain heat. This ability comes in handy in two ways that you will also appreciate. One, it enables the kettle to heat the water quickly. And two, it enables the kettle to keep the water hot for longer after you have turned off the stove. There is something special about the silver color of stainless steel, especially on kitchenware and appliances. And this one certainly has that classic stainless steel design which fits well in any kitchen. How many cups of tea do you drink each day? What about at a time? Well, I try to limit my tea and coffee drinking to keep my daily caffeine intake down. For that reason, I didn’t mind the small size of this tea kettle. This cute, little kettle will boil you six cups of water. It has a modern look, navy blue in color, a stunning design that improves the look of any kitchen it’s placed in. It has a unique handle design. The spout is attached to the handle via a lever. When you squeeze the handle, the lever lifts the cover which is over the spout, enabling you to pour the water. I don’t know about you, but I don’t enjoy cleaning things, especially when I know the process is prolonging more than it should. So I liked this Circulon tea kettle quite a lot due to the ease of cleaning it afforded me. The bright enamel exterior is resistant to stains, and so cleaning was quick. And when the water boils, you will know, even if you are not in the kitchen when it happens, thanks to the whistling. This is the best stovetop tea kettle so long as you are making tea only for yourself and one or two other people. It’s a small one, but is high quality, with several features which made me enjoy using it. Let me tell you about some of these features. I like how clear the glass is. You can see right into the kettle. When you steep your tea in the water, you can watch as the water’s color turns. The glass is premium borosilicate – it should remain clear, without getting cloudy, even with years of use. The borosilicate glass is heatproof and is of a similar quality to test tube glass. It was made to withstand hot, boiling water. And it has undergone optimization – it has been thickened to give it the sturdiness and durability you need from it for daily use. Though the kettle is dishwasher safe, the company recommends cleaning it with soapy water and then gently rinsing it out. The knocks and hits it would receive in the dishwasher might damage it. For the best stovetop tea kettle, consider this OXO product. It’s made of stainless steel which is perfect for preventing rust. I liked the large lid opening most. Some openings are so small that when you are filling your kettle with water, you have to call upon all your inner Zen ability to keep yourself from accidentally pouring water on the sides of the opening onto the table or stove. And since the lid opening is relatively large, you have an easy time cleaning. Your hand will easily fit, enabling you to clean the interior of the kettle properly. This Cuisinart is made of steel, so you know it’s durable. But coating the steel is a porcelain enamel exterior. The enamel is painted a pretty red, making the tea kettle a stunning addition to your kitchen. I liked that it didn’t take too long for the kettle to heat up. And also that once it had heated up, it was able to retain most of that heat for an extended period. It won’t go cold too fast, and that will enable you to get two or three rounds before the water becomes lukewarm. The kettle has whistles which will alert you when your water starts boiling. This Primula Catalina tea kettle looks like something they would use in the future. The design is out of this world. It has smooth curves all over, and the flawless, white surface makes it stand out in any environment. That’s one thing I liked about it. Like the Japanese masters of tea, I take great pride in my tea-making utensils/appliances. I think it improves the tea's taste. The stainless steel construction guarantees you that the kettle will give you long term use. It won’t rust. It has a larger capacity than most of the products in these tea kettles reviews. At three quarts, you will boil enough water to make tea for several guests. This is the tea kettle you use when you get unexpected guests – it won’t embarrass you! The lid is removable. That makes it easy to put a hand in and clean it properly. It did not give me any grief when cleaning; nor did it give me any trouble when pouring water into its lid opening. From the moment I saw it and started using it, I knew this was a top-quality tea kettle. For one, it is a work of elegant craftsmanship. But it is not mere beauty without utility or practicality. The glass borosilicate design has a brushed metal finish that ensures this kettle is both scratchproof and shatterproof. The glass material can withstand temperatures as high as 150 degrees Celsius. Since water boils at 100 degrees Celsius, you can count on this stovetop tea kettle to be equal to the task of boiling water for your tea. Once the water boils, turn off the heat or take the kettle of the fire. I have often had to use a crumpled piece of newspaper or a rag to wrap around the handle of my tea kettles before I can touch it. I didn’t have to do that with this one. The handle is thermal resistant, so you can confidently grab it even when the kettle is filled with boiling water. The handle is also comfortable, which I found helpful when I boiled a large amount of water and had to hold all that heaviness in my grip. I was able to prepare all sorts of teas with it: oolong, green, black, and even Pu-erh tea. This satisfied me that this was one of the best stovetop tea kettles in the market. On cold days, I brewed hot tea. On warm days, I used it for cold drinks – the glass can withstand temperatures as low as -30 degrees Celsius. I also liked that it’s not a one-piece. It consists of three separate, detachable parts. This made cleaning significantly less cumbersome than it would otherwise have been. This Osaka product may be the last of our stovetop tea kettle reviews, but it is not the least. With a capacity of three quarts, it’s one of the biggest kettles I have reviewed in this article. You can boil enough water to service both you and your guests and have some left over. Three quarts will give you enough water to fill 12 cups. Stainless steel is the best material for constructing tea kettle, and there are two main reasons for this. One, stainless steel is lightweight, and two, it’s durable. This tea kettle is made of a high-grade steel that is durable and doesn’t rust. The steel is coated with enamel with a vibrant color that will continue to shine years after you first purchase it. It comes with a handle made from high-quality Bakelite – it is sturdy and durable. It is also engineered to comfortably fit in your hand, giving you total control over the tea kettle as you pour the tea. Tea originally came from China, but it was perfected in Japan. The “art of tea” is a Japanese phenomenon – in Japan, this art is called “chanoyu”. How fitting then that the last review should be of a Japanese brand. All these things were going through my head when I began to use this tea kettle, and it did not disappoint. Now that I’ve given you my list of the best tea kettles reviews, next I’ll reveal to you the guide I’ve been using for all those years to ensure I end up with the best models. You might be pulled into buying an electric tea kettle given the speed at which it boils water with. With that in mind, it’d only make sense of you buy one that’s powerful enough to complete the job as fast as you want it to. Most of the top-rated units come with a 1500watt heating element. This is more than enough to boil your full kettle in minutes. Others come with 1000-1200watt which also exceptionally well to make your water ready in the shortest time possible. As you’ve already seen in our electric tea kettle reviews above, most models come with variable temperature controls. This is important as it helps you set you preferred water temperatures, depending on the type of tea you intend to make. Additionally, ensure your kettle is cordless to help you pour without the cord inconveniently dangling from the pot. Depending on how much tea you intend to make, the size of your tea kettle should be one of the determinant factors when buying an electric kettle. The capacity of most models ranges between 1-2 liters, with most of them having a 1.7liter capacity. If you only need to make a cup of eta for yourself, consider going for the smaller modeler. But of you want to make tea for office or waiting room, consider buying the bigger models. As I told you at the beginning of this post, different electric kettles are construed using different materials. The most common material include glass, plastic, stainless steel, copper, and ceramic. I still stand by my opinion that glass and stainless steel models are the best as they give you an easy time when cleaning them and don’t require much maintenance. But again, the type of material for your kettle boils down to your personal preference. Which material would you wish your electric tea kettle to come with? It’s no brainer that you’ll be dealing with hot water which is hazardous. Its, therefore, important that you take safety as your primary factor when deciding on which electric kettle to buy. The most common features I’d advise you to look for in any unit include the auto shutoff function, boil-dry protection, and a stay-cool handle. Just like the electric units, the stovetops also come in different materials: anodized aluminum, copper, stainless steel, or glass. In our reviews above, we have concentrated on stainless steel and glass. Aluminum has many benefits. For one, it is energy-efficient. For that reason, it will help boil your water faster. However, it is not as efficient as copper. Aluminum material is not susceptible to stains and scratches. This has two advantages: one, it makes aluminum material durable and able to maintain its original beauty even after an extended period of use. And two, the resistance to stains makes cleaning an easy task. Another advantage of aluminum is that it’s lightweight. That will come in handy when you are walking from one room to the other with your kettle full of water. It also means that it’s an excellent kettle to take camping with you. Health concerns have been raised about using aluminum cookware. However, the issue is still clouded in confusion and divided opinions. The most popular material for tea kettles is stainless steel. It is easy to see why. For one, stainless steel is naturally lightweight. Portability is an attractive quality in a tea kettle. But best of all is the durability of stainless steel. The material is crack-resistant and rust-resistant, qualities that make it indispensable in a kettle, considering how often it has to come into contact with water – boiling, no less! But you must be careful. Not all products which are marketed as “stainless steel” are reliable. Some are made from low-quality steel, and after a short while of use, you begin to note that a coat of rust has formed inside your kettle. Another advantage of stainless steel is its bright finish. Stainless steel kettles are attractive, and clean-up is quick and easy. On the downside, stainless steel does not heat quickly. Glass stovetop tea kettles take the cake when it comes to attractiveness. It also helps that one can see through the transparent glass into the kettle. When you steep your tea in hot water, you can watch as it suffuses the water and turns its color. One thing you should remember though: take care not to heat glass kettles too fast – changing temperatures too suddenly can cause the glass to shatter. They conduct heat better than stainless steel tea kettles. However, due to its softness, copper can tarnish easily – as such, copper tea kettles are high-maintenance. You will also need to take care when cleaning it – you don’t want to scratch it. If you are looking for something highly durable, there is no better choice than a cast iron kettle. On the other hand, they are heavy. Don’t buy a cast iron kettle if you want something you can take with you camping. The main problem with cast iron, however, is not even the heaviness. It’s the susceptibility to corrosion. For that reason, such tea kettles are coated with enamel inside. And when you clean them, you must be extra careful to ensure you don’t scratch the coating. These tea kettles do not heat up fast, and it takes a while before the water boils. However, once the water has gotten hot, it will be quite a while before it becomes lukewarm – they have excellent heat retention. The next most important consideration is the size and capacity of your tea kettle. If you want something that will help make tea for a large group of people, you should look for one that has a large capacity. For instance, one of the kettles I have reviewed here can fill 12 cups of water. But if you are making tea only for yourself, a small kettle will do – and it will be cheaper too. That which whistles or that which does not whistle? That is the question. My answer: it’s a matter of taste/preference. Some like the whistling sound and like to have something alert them that the water has boiled. Others, however, may find the whistle annoying. Sorry, I didn’t share this list of the top rated tea kettles with you earlier. I only shared it with my Kitchen (I have the list pinned in my kitchen noticeboard), neighbors and colleagues. If you’ve read this post from start to end, consider yourself lucky because you can now confidently pick that best tea kettle from the many options out there and start brewing your tea the best way. I’ve used most of the products I’ve listed above in my own kitchen (and the others in my dorm room, in friends’ kitchen and office). I can, therefore, guarantee you that these kettles will give you the maximum performance and help make your cup of tea whenever you crave for it. They’re built to last, are incredibly easy to use, and will make you want to make tea every hour! Here’s to many more cuppas!